Today I have some quick and easy mermaid nail art to show you. 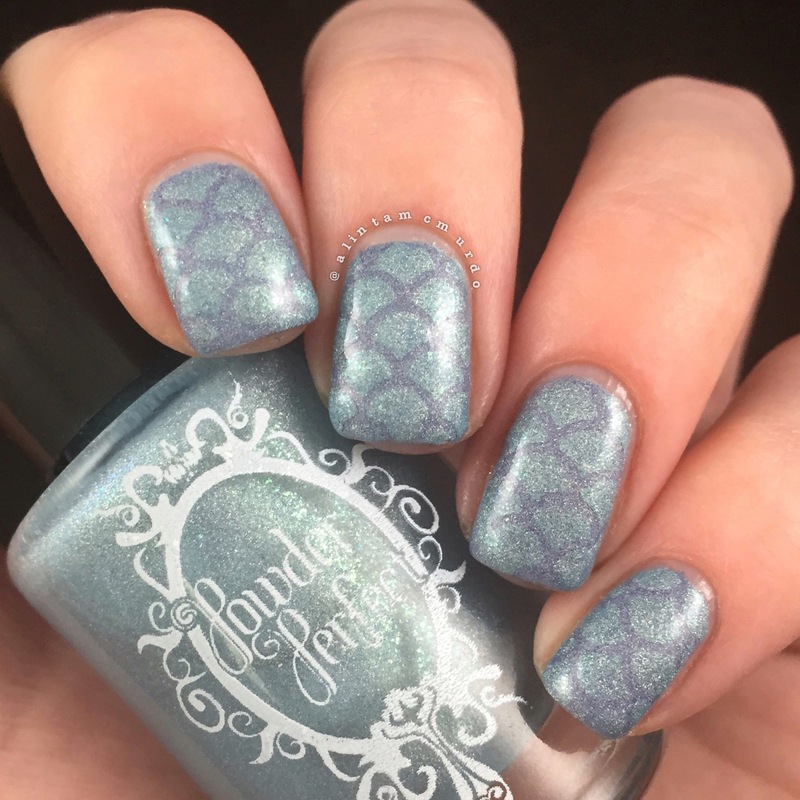 I wanted to use two polishes I have from The Haven Collection from Powder Perfect and thought that they would make a pretty mermaid tail colour. I had to choose something really easy as I’m not very well at the moment. I was actually in hospital between now and the last post I wrote and I’m still in a lot of pain, so don’t be too hard on me with this mani. Powder Perfect The Haven is an exclusive collection for Live Love Polish, but I was able to pick up a couple of the colours when there was a small release in the Australian Powder Perfect shop – I regret not getting them all now. To create this mani, I started with two coats of Powder Perfect Precious Moments to create a pretty blue base. I then added a thick layer of quick dry top coat – you need to wait at least half an hour before moving on to the next step. 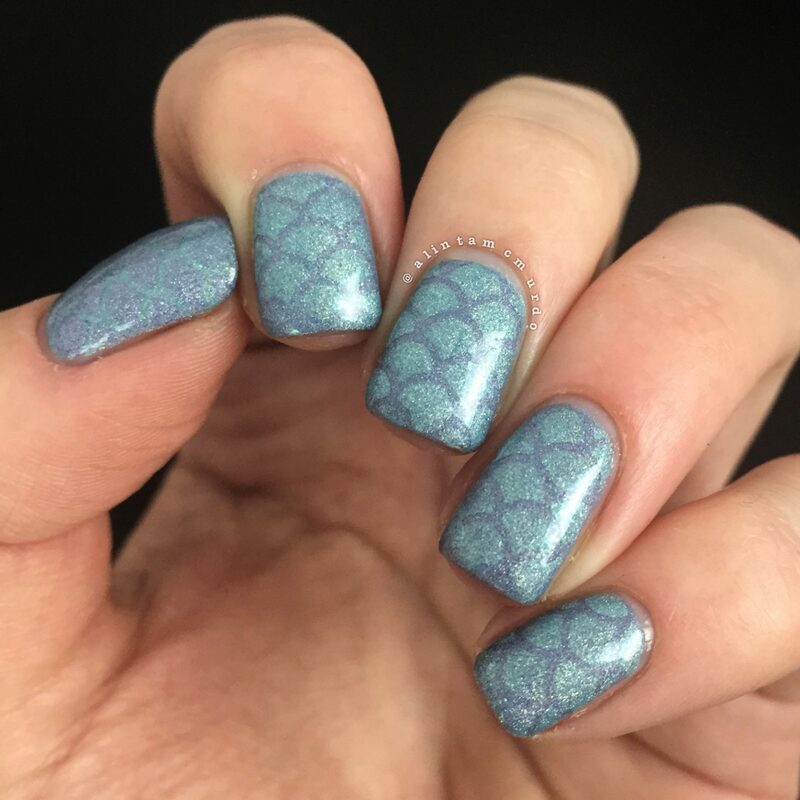 Then I stuck on my What’s Up Nails Mermaid (scale) Stencils and painted a thin layer of Powder Perfect Cherish over the top, ensuring that I pulled the stencil off immediately so that the polish didn’t dry. If you leave the stencil/vinyl on too long, then the polish will stick to the stencil when you pull it off, and your design won’t turn out the way you want it to. I really like the What’s Up Nails vinyls and stencils because they’re good quality and a good price. What’s Up Nails is an American brand but I have always received my vinyls within two weeks, so it’s not a long wait for me. This time, I was unfortunately a bit out of it and applied all the stencils upside down for my normal hand pose (damn painsomnia) – it just means I get to enjoy looking at the nail art myself this time. I decided to use two very similar colours as any mistakes I made are less obvious this way, but you can use any colour combination you want to make your mermaid nails. The Haven Collection from Powder Perfect is unfortunately limited edition. Live Love Polish still have some in stock but there aren’t any left on the Australian Powder Perfect website. Live Love Polish ship to the USA and Internationally, but international shipping can be expensive. 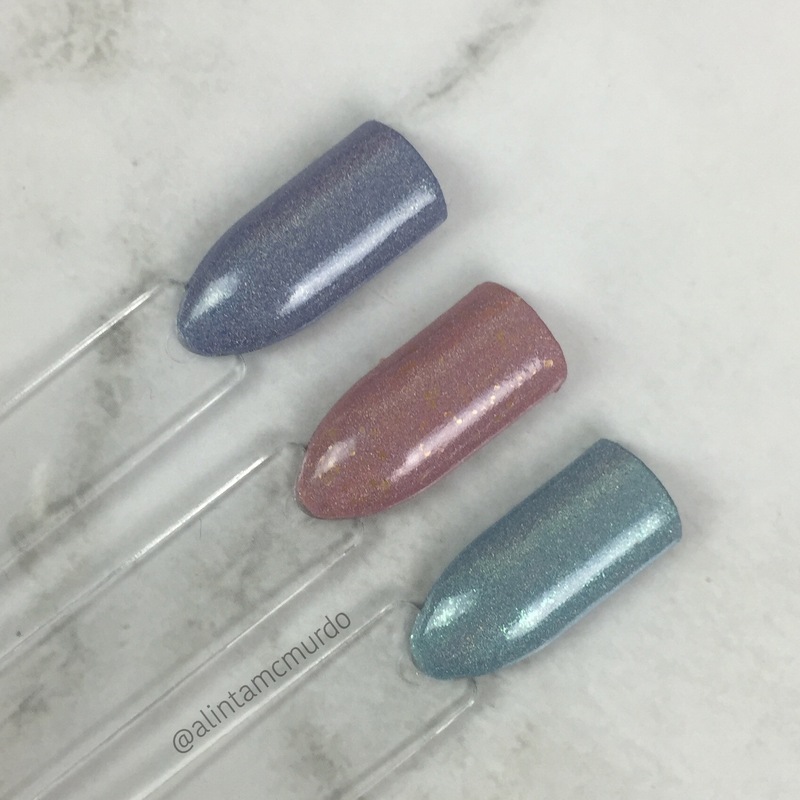 I was able to get my hands on Precious Moments (a holographic periwinkle blue), Cherish (a a light aqua holographic polish with green sparks that can be seen in the light), and my favourite, Sugar & Spice (a pretty light pink with golden flakies). The golden flakes in Sugar & Spice are so beautiful in the pink base, I know I will wear this polish a lot. As I said earlier, I regret not getting them all, but especially To The Moon & Back, as that has the same flakes as Sugar & Spice – I’ll have to see if I can afford the internationally shipping cost to get it. Creating mermaid nail art with nail vinyls/stencils is a really easy way of doing something special with your nails. There are so many colour combinations I want to try, I just need the energy to do them all. What colour combination would you do if you did mermaid nails? You can check out posts from other beauty bloggers at Fabulous and Fun Life. This mermaid nail look is gorgeous! You are a lot more patient than me however! I would be so impatient waiting half an hour between steps in this mani. I hope your pain levels subside soon and become more manageable.